Just memories? 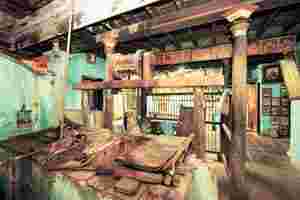 Interiors of Kannan’s 500-year-old house that?sits across the street from the Parthasarthy temple in Mylapore. Kannan’s house, which sits across the street from the ancient Parthasarthy temple in the heart of Chennai, has not changed in 500 years: the palanquin his forefathers used now hangs on wooden beams and he draws water from the same well as them. In his backyard, a brown calf chews cud. For centuries, Brahmin families such as Kannan’s have lived and worked in the streets or villages around ancient temples. These four streets, called the agraharam, created a subculture where Brahmin priests lived a chaste life and performed traditional duties as priests and teachers by running the temple and teaching the Vedas to students. They essentially formed the ecosystem that ran the temples of south India. Yet, against a backdrop of Tamil Nadu’s anti-Brahmin movement, government policies outlawing the Brahmin-only colonies, skyrocketing real estate prices and Brahmins’ declining social relevance, the culture of the agraharam and people such as Kannan, who uses one name, are becoming a rarity. Earlier this year came another policy change—temple authorities will now train their own priests, and priests no longer have to be Brahmins, making older Brahmin priests all, but irrelevant. With growing economic prosperity and migration, many of the streets occupied by Brahmins in south Indian cities are finding it hard to resist selling out. “I would get about Rs3 crore for it (my house). But I will not sell. I want my children and grandchildren to own it. Without this house, what am I?" says Kannan, who has a postgraduate degree in economics. Brahmins are finding ways to survive in changing times, while clinging to old traditions. Babu Das grew up helping his father run a canteen, or mess as it is called in south India, inside his pink-coloured home at the Kapaleeshwar temple agraharam in Chennai’s Mylapore area. The Karpagambal Mess is famous for its authentic Tamil snacks, home-made idlis and dosai served on banana-leaf plates while playing while playing M.S. Subbalaxmi’s rendition of the Vishnu Sahasranama, the thousand names of Vishnu. Das inherited the canteen from his father, but does not know how old the building is. “I love everything about this place. No one wants to change anything about it. The people who come here to eat like it for what it is. After all, money can buy you the latest trends, but will it bring back this tradition?" he asks. Many traditions related to agraharams have been fading for some time. In 1996, a government order recreated the Hindu religious and charitable endowments administration department to supervise the administration of 36,363 temples, 56 maths (which are a type of ashram) and about 1,910 endowments in Tamil Nadu. Priests, meanwhile, are receiving training more formally in gurukuls, schools where a new generation of priests is taught the Vedas. These vedic boarding-schools are largely set up outside Chennai. Thirumagal, the joint commissioner at the Temple Endowment Board who also uses just one name, agrees that the agraharam has been a part of the temple culture, “but we are only supposed to look after the temples. The agraharams are not our problem. The municipality must look after them". But municipality support of landownership based on caste poses both a legal and moral dilemma in a new India. And the real estate boom adds to the agraharam’s woes. For example, developers here are paying Rs70-80 lakh for 2,400 sq. ft of land around the Parthasarthy temple. It’s a price that’s hard to refuse for poorer Brahmins who have only known squalor and hunger in their ancestral homes. “They sell their house, buy a flat in the city, put the rest of the money in a bank and live on the interest," explains T.K. Raju, a clerk who lives at the agraharam of the Parthasarthy temple. In addition, the community’s younger generation, namely a few notable high-achieving math wizards, has typically found homes in places such as California’s Silicon Valley. Not many of them are likely to return, most here agree. “People need to understand that Brahmins are not rich," said C. Venkatesh, a Brahmin who works as a freelance consultant for computer companies and lives in the agraharam of Kapaleeshwar temple with his wife Revathi and their seven-year-old daughter, Shreya. Meanwhile, the growing irrelevance in temples has forced these Brahmins to re-invent themselves. Many became clerks in government offices and when that did not pay enough, they became cooks and shop assistants in jewellery and silk sari emporiums. Raju, for example, was a clerk in the Madras high court. Some 10 years ago, he quit. “My children were growing up. I had to educate them well and I could not afford to pay the bills on my salary. So I went into catering." The gamble worked, he says. “My son is in a good high school and my daughter is pursuing a masters degree." Raju’s home, called Komati Bungalows, is a long, narrow street with small huts on both sides. For 100 years, 50 Brahmin families have lived in these huts, which are built on land belonging to the Ayodhya Temple Trust. “A lot of land and houses of the agraharam belong to the temples," Raju says. Venkatesh says that poverty was the main reason why people sold their homes. “If I have to look after ageing parents, medical bills to pay, a sister to marry and my children to educate, and someone comes to my house with money…will I not sell? You may not want to sell, but when poverty comes to your door, can you hold out?" Yet, for people such as Babu, life is still about the temple. He remembers going to the Kapaleeshwar temple every evening to play with friends, and straddle stone elephants. “Life revolved around this temple," he says. “It was more than home to us. We did the temple work, carried the palanquin, and often, just hung out." Babu says he feels desolate when his neighbours sell their homes, or when the temple rents out land for commercial shops and says he does not plan to sell. “I take my daughters out to sit on those elephants now. This life means something. And when they grow up, I want them to have this place." But saving the place for his daughters will not be easy. First, “there are no heritage laws in Chennai. Unlike Mumbai and Delhi, the city administration has not done anything for conservation", says Vincent D’Souza, editor of a local paper, Mylapore Times, who works closely with a conservation group that conducts walking-tours of the area for citizens. Without heritage laws, conservation organizations like his group, have no legal recourse. “If someone wants to protest, where will they go?" Drafting heritage laws will not be easy. In a state with a strong anti-brahmin lobby and 80% of the state population under quotas, any move to conserve brahmin culture will be perceived as a political statement. Raju says, “In this state, it is hard to help the Brahmins. We are the political untouchables." It remains a matter of debate in Tamil Nadu’s society about what it wants to conserve. The soul-searching remains and week after week, this citizen group continues to peel back layers of history in the architecture of the streets around Kapaleeshwar temple. They watch new high-rises come up and feel frustrated when a familiar old home on the street is replaced. But in the current political-economic enviornment, D’Souza is not too hopeful. “There is nothing that can be done," he says. “Not many people care about heritage."